In the two years it has been active, it has been used nearly 45 thousand times! Thank you for all of the support and kind words. I hope this tool will continue to be useful to those that need it. Configuring a wireless network on Android. There are no default certificates, and no easy way to add them. Feel free to go straight to the tool. Recently I switched to Verizon and was immediately drawn to the Motorolla Droid. It is my first smartphone and I must say, it is magnificent! Besides a few hardware concerns (flat keyboard being the major complaint), it is the best phone I’ve ever owned. One of the reasons I got a Droid, rather than only using my Zune HD, is because it can connect to WPA-Enterprise networks using PEAP authentication. I spend most of my time on my college campus (Purdue University), and we have to login to the wireless network using WPA-Enterprise with PEAP, so the Zune HD was not able to use the wireless network. However, the Android platform can (at least on the Droid, which runs Android 2.0.1) connect using WPA with PEAP. The only problem with them is that there is no easy way to install the CA certificates necessary to connect to the network. To do this, you have to navigate to an x509 certificate with the correct HTTP headers in the browser. It only requires a few lines of PHP code and the CA certificate, but not many people have easy access to a PHP server or the technical knowledge to use it. Thus, RealmB’s Android Certificate Installer was created. 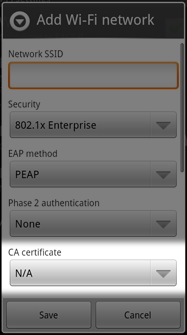 It allows you to upload a CA certificate from your computer, or from a URL, and have the browser receive the correct headers that launch the Android’s internal CA certificate installation process. The tool is located at http://www.realmb.com/droidCert/. Any comments, questions, or thanks can be left as comments here. Note: I am especially interested to see if this works on non-Droid Android phone, so if it works, could you post a comment saying what type of phone you have and/or what version of Android you are running? (Android 1.5, 1.6, 2.0, or 2.1) Thanks a lot! Update: I found the site where I found this little header trick: Android Security Discussions – Google Groups. Thanks to user “lynx.” The post is two thirds of the way down the page. Update 2: Some commentators have said that this does not work on Android 1.5, sorry about that. It has been confirmed to work on Android 1.6 and above. LiteImgResizer with no document open. LiteImgResizer v0.0.1 has been released into the wild (actually four months ago, but I never wrote a post about it). It is the first release of my image resizing program that aims to be very light and quick. It is open source, and is hosted on Sourceforge. Improve PNG save filesize; perhaps use a different image library (ImageMagik)? 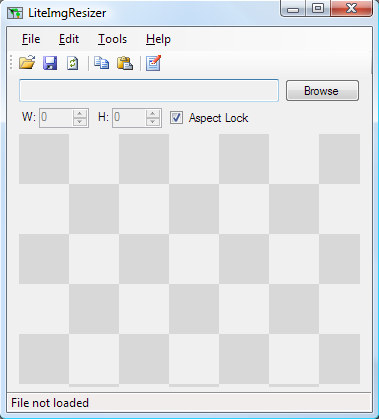 LiteImgResizer can be downloaded at the Sourceforge project page. Hello, I am Brian Kelley, a Computer Engineering student attending Purdue University in West Lafayette, IN. I am a senior, specializing in ASIC/FPGA design. This site will serve as a portfolio for my school, personal, and job projects.